Fritz Kucklick specializes in complex cases such as industrial contract disputes, trade secrets, patents, and industrial personal injuries. Kucklick’s expertise is based on a mechanical engineering degree and a career that included co-founding and growing a 500 employee international manufacturer of metal forming machinery, tooling and production lines for automotive, metals, and other industries. Personal responsibilities have included creating process, tooling and equipment concepts, cost estimating, preparing proposals, presenting and negotiating contracts, design engineering, training, project management, starting and integrating complete metal forming and assembly lines in the U.S. and overseas, and P&L responsibilities. Fritz Kucklick possesses strong written, spoken, demonstrative and presentation abilities from many years of commercial negotiations, training and making technical presentations to international audiences. Retained by Plaintiff, a successor corporation that had purchased machine tool intellectual property and other assets from a bankruptcy. Plaintiff sued Defendants on allegations of misappropriation of trade secrets, among others. Kucklick reviewed documents, machine control software programs, engineering drawing files, and other documents, and prepared a report. Case settlement was favorable to Plaintiff client. Retained by Plaintiff, a Louisiana manufacturer of oil field equipment. Defendants, an Asian manufacturer and its American dealer, sold Plaintiff three CNC lathes (“Machines”) represented as new. From day one, none of the machines were sufficiently reliable for Plaintiff to perform reliable production, even after several attempts by Defendants to repair them, resulting in downtime, excessive costs, and lost business to Plaintiff. Kucklick’s investigation determined that at least one of the supposedly new Machines had been previously sold, delivered to, and rejected by another U.S. customer. Kucklick contacted the original buyer of the Machine at issue, not a party in the present litigation, whose verbal and written descriptions of its defects, later supported by his testimony, closely resembled Plaintiff’s problems with the machine which bore the same model and serial number. Settlement was favorable to Plaintiff client. Retained by Plaintiff, a U.S. automotive electrical parts manufacturer; the equipment at issue was a new production line located in South America. Said production line had been designed and manufactured by Defendant, an Italian manufacturer. Plaintiff alleged equipment delivered by Defendant was defective and caused Plaintiff to lose production, causing Plaintiff to manufacture many spare parts and tooling, reprogram the controls, and ultimately replace the entire production line. Kucklick was retained to opine on the Plaintiff’s defense of Defendant’s allegations of misappropriations of trade secrets. At issue was ownership and rights to Defendant-created engineering drawings and control system software, which had been custom designed and manufactured for Plaintiff. Kucklick’s examination included review of purchasing documents, correspondence, engineering drawings, and machine programming language. Kucklick prepared an engineering report, and testified at deposition. 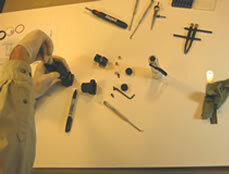 No physical inspection was conducted; the equipment at issue had been removed from production and no longer operable. Retained by Defendant, a manufacturer of agricultural harvesting equipment. Plaintiff asserted several claims of its patent, and in the meantime had received an additional patent on the alleged device. Kucklick’s work to prepare an invalidity report included review and reference to prior art that included advertising, published articles, physical inspection of multiple machines, and patents. Kucklick testified at deposition. Kucklick also prepared an IPR declaration for a newly issued patent on the same technology, testified at deposition, and attended a deposition of opponent’s expert. Retained by Plaintiff, who had sued for payment for work performed; Defendant countersued, alleging expenses, replacement work, and lost production. Defendant had hired Plaintiff to perform months-long engineering studies and services with the objective to improve productivity within Defendant's military truck assembly line. Days before the completion of the frequently revised contract, and after all of Plaintiff's deliverables had been submitted, Defendant canceled all outstanding purchase orders, refused to pay Plaintiff for work performed claiming all work was unusable, and hired another company founded by ex-Plaintiff employees to allegedly replace all of Plaintiff's work. Kucklick’s examination revealed that Defendant had used and benefited from the use of Plaintiff’s unpaid work product, and had conspired with former Plaintiff employees to give the job and payments to their newly formed company while Plaintiff was performing the contract. In addition to extensive PDF documentary production, Kucklick relied on Plaintiff’s and Defendants’ Microsoft Outlook PST files from before, during, and after Plaintiff’s contract, to analyze emails and attachments in native format, not otherwise produced, that required special software to open. Settlement was favorable to Plaintiff. The managing partner of the retaining law firm complimented Kucklick's report as the best technical expert report he has ever seen. "Fritz, you are a first-class expert and professional. Thank you for a superb expert report that made a huge difference in our case." Retained by Plaintiff/counter-Defendant. Plaintiff builds military vehicles, and had previously purchased vehicle armoring components from Defendant. Plaintiff redesigned the components previously purchased from the Defendant, obtained its redesigned parts from others, and sued Defendant for breach of contract. Defendant countered, alleging misappropriation of trade secrets and significant damages. Kucklick's work focused on the trade secrets defense aspect of the litigation. Kucklick inspected and analyzed vehicles, drawings, and components at issue, prepared a detailed report, testified at deposition, and prepared video and live demonstratives, and testified at trial. The Court's decision cited Kucklick's report, demonstratives, and testimony several times. Retaining client won a judgment worth in excess of $275 million and defeated in full counterclaims asserting misappropriation of trade secrets that sought approximately $750 million. Comments included "the judge credited your testimony and largely rejected [opposing expert's]," and "Obviously the client is thrilled with the result." Retained by Plaintiff. Plaintiff had purchased a new CNC lathe. On approximately its second day of operation by Plaintiff, the new machine ejected a 25-plus pound (12kg) workpiece through the front guard of the machine, striking and permanently disabling the Plaintiff. Before Plaintiff purchased and took delivery of the subject machine, the Defendant had learned of an ejected workpiece incident involving an identical machine, in another country, that resulted in fatal injuries to the operator. In that geographic market, Defendant had immediately halted sale of the Plaintiff's model, and warned all users to discontinue use, pending redesign and retroactive modification of the originally designed front guard in all machines within that market. Plaintiff's machine had not been updated, nor had Plaintiff been made aware of the previous fatality or Defendant's ongoing modification program involving machines outside the U.S. market. At the time of Plaintiff's injury, Defendant had not planned to suspend sales, warn users or retrofit any machines in the U.S. market. 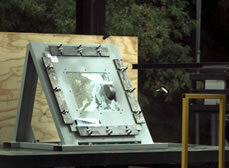 Kucklick inspected the worksite and the subject machine, and determined the likely exit velocity of the ejected workpiece based on site measurements and calculations. Kucklick posited a hypothesis that a relatively inexpensive redesign would have prevented Plaintiff’s injuries. To validate his hypothesis, Kucklick designed a testing program, designed and manufactured sample guard assemblies with original and revised guard assembly designs, supervised ballistic testing at a nationally recognized laboratory and prepared a detailed report. Retaining counsel commented, "this Rule 26 report should be the gold standard for all Rule 26 reports." Retained by Plaintiff, an American subsidiary of an international supplier of body and chassis assembly and welding systems for the automotive industry. Plaintiff sued for payment due for a multimillion dollar, custom-designed and manufactured body and chassis assembly system for a specific series of pickup trucks, to be ultimately integrated into Defendant's assembly plant. During a late stage of machinery manufacture, the automotive OEM Defendant abruptly changed the vehicle models to be manufactured, assigned dozens of its engineers to work inside the Plaintiff’s machine-building factory, commandeered all operations, and caused significant scope changes, costs and delays of the purchased equipment. Defendant's counterclaims included allegations that the Plaintiff was incompetent, did not perform to contract, did not manage the project in a professional manner, and that the equipment as-designed would fail to perform reliably with the revised, heavier vehicle that Defendant had decided to manufacture during its scope revision. The custom-designed equipment at issue comprised robots, conveyors, lifters, electrical controls and other elements within an integrated manufacturing system. During review of the case, Kucklick read and analyzed deposition transcripts, quotations, contract specifications, correspondence, technical information, 3D and 2D CAD engineering drawings, production control and project management information, and all other produced documents; Kucklick also performed engineering analysis and calculations of the Plaintiff’s original designs, performed an on-site inspection and analysis of the disputed equipment within the Defendant OEM's assembly plant, and prepared multiple reports. Retaining counsel wrote, "I am pleased to advise you that the case has settled. [Automaker] will pay an additional $_ million. Thank you for all your excellent work." Retained by Defendant, an international manufacturer of automotive components. Plaintiff asserted fourteen patents comprising hundreds of claims, including product-by-process claims, for manufacturing processes of cold-forged steel automotive engine components. Kucklick reviewed all patents and claims at issue, located and reviewed prior art publications, reviewed and analyzed engineering drawings, correspondence, interviewed client engineers and manufacturing personnel, arranged for and analyzed metallurgical reports of suspected prior art components, reviewed and analyzed deposition transcripts, prepared claim charts, prepared an invalidity report that included obviousness, anticipation and best mode analyses, and provided deposition testimony. Retained by Federal Defender’s Office. Two automotive Tier One suppliers had been litigating a breach of contract dispute over the supply of forged metal parts. An employee of one of the Tier One parties, with an accomplice, offered to sell documents to the other Tier One party, who in turn reported the offer to the FBI. The FBI met with one or both defendants, purchased some documents, seized additional documents, and arrested and charged the defendants. Kucklick's task was to determine whether purchased and seized documents contained trade secrets. Kucklick reviewed case documents, including the purchased and seized documents, FBI reports and affidavits, and other documentation produced in the case. Kucklick also reviewed publicly available materials, including pertinent SEC filings, and prepared an expert report. Case was resolved prior to trial for both defendants. Retained by Plaintiff. Plaintiff sued for final payment, after demonstration on Plaintiff's own tryout press, and delivery, of thermoforming tooling for manufacturing door panel parts for an automotive OEM. Tooling was designed to fit into and be actuated by the Defendant's existing thermoforming presses contained in Defendant's production line. Defendant's counterclaim alleged excessive scrap and lost production because, among other things, the tooling was incorrectly designed and manufactured. Kucklick's task as litigation consultant and expert witness was to form opinions whether the tooling was properly designed and manufactured. Kucklick read and analyzed documents including quotations, the contract between the parties, notes, 2D and 3D CAD and paper engineering drawings, drawings and other information concerning the Defendant's machinery in which the tools were to be operated, correspondence, deposition transcripts. Kucklick also conducted an on-site physical inspection of both the Plaintiff's tryout press and the Defendant's production machines, prepared a report, and provided deposition testimony. Retained by Claimant, a foreign distributor and seller of off road construction equipment. The joint venture was for Respondents to build and equip a U.S. factory to manufacture mobile construction equipment according to Respondents' patented designs. Claimant provided several million dollars' funding, some of which included loans secured by real estate and other assets. Respondents depleted funding prior to beginning full production; Claimant refused to provide additional funds, claiming waste and misuse of the money by the Respondents. As the Claimant's expert witness and arbitration consultant, Kucklick reviewed and analyzed all produced documents, affidavits, Respondents' designs and patent, Respondents' assets acquired for the factory, information from third-party resources, and physically inspected finished products. Kucklick prepared an expert report and provided direct and cross-examination testimony at an arbitration tribunal. A client’s representative remarked, "[Your testimony] hit them like a missile landing in their bunker." Retained by Plaintiff. Plaintiff was struck and injured by a several-ton mobile, tracked robot as he performed maintenance on a CNC machining center within an automatic work cell. The robot allegedly started traveling toward Plaintiff without warning, and did not stop after a colleague actuated an emergency stop button. Kucklick reviewed and analyzed all produced documents including accident reports, depositions, machine drawings and manuals, and ANSI and OSHA standards and information. Kucklick inspected a similar robotic manufacturing system on public display at another site, physically inspected the accident site, observed operation of the subject machinery, demonstrated the emergency stop button's failure to stop the robot, and prepared multiple reports. Retained by Defendant. Plaintiff sued defendant automotive Tier 1 parts manufacturer for final payment. Plaintiff's scope of supply was to remove several mechanical power presses from a Michigan facility, rebuild them, store them, and re-install them in Defendant's production line in Mexico. Defendant countersued, alleging that Plaintiff failed to properly perform, resulting in Defendant's need to hire others to re-do and complete rebuilding and re-installation portions of the equipment in Mexico. Kucklick reviewed and analyzed drawings and manuals of the machinery, deposition transcripts, photos, reports, and other materials. Case settled prior to Kucklick's deposition and report. Retained by Defendant. Plaintiff's estate sued the German manufacturer of a large CNC metal spinning machine following the death of a technician who was allegedly crushed while maintaining the subject machine. Kucklick analyzed accident reports, machine engineering drawings, inspected the subject machine on site, and performed engineering calculations. "You did a nice job for us in the [large agricultural machinery company] case!"